Oh, how my heart is happy!! I must admit when I first picked this book up, I kept wracking my brain to who this Longfellow was. The name sounded familiar, but I couldn’t place it. So I googled it and found my answer and was greatly distraught afterwards. I’m not one for book spoilers and that basically told me how his story ended, not how the book ended. I realize Forever and Forever is their love story, but to know the final part, was almost more than my heart was prepared for. So I sat down and read with a heavy heart and began their journey. When we first meet Fanny, she’s an 18 yr old with not a care in the world. Very young and immature at times. Most women her age were looking for husbands, but not her. She was content with living under her father’s roof and off his money. She wasn’t cruel or evil, mind you, just very immature. I found as I was reading, I really wanted to shake some sense into her. 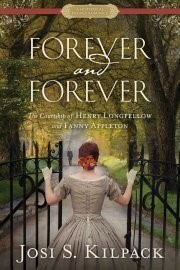 She was making me so very angry with her attitude towards Henry Longfellow. Henry was a widower and a professor, when he first laid eyes one Fanny. I loved him instantly. He loved and lost and you knew he wasn’t just going to give his heart away to anyone. He wasn’t even looking for anyone, until he stumbled upon Fanny. Slowly he started to fall for her and spent 7 years convincing her to give him a chance. As I said before, I knew how their story ended, so I spent most of the book quite angry at Fanny for dismissing him so easily. He was so romantic with his poems and books. She didn’t deserve him, but he loved her and was patiently waiting for God to change one of their hearts. By the time I was done, I had tears flowing. She wasted so many years being stubborn. I’m just glad they had time at all. Now this book isn’t classified as Christian romance, but it could be. God is mentioned a few times, but it’s a very good balance. Religion was a very important part of this history, so I find it refreshing. Forever and Forever is my first book by Josi, but I know it won’t be my last. Thank you for this review, I especially like the line you used “he loved her and was patiently waiting for God to change one of their hearts.” That’s exactly what happened. The end of their story is so sad–I almost didn’t write the book because of it–but they were SO happy together during the time they had and the more I thought of it the more I felt like that beauty deserved to be celebrated. Thank you for your review! It’s devastatingly beautiful. Thank YOU for sharing this story with us!